Conventional: Patented pre-vegetated moss-sedum mat installed on one layer of water retention fleece, drainage/filter layer and root barrier. PMRA stones below: Patented pre-vegetated moss-sedum mat installed on one layer of water retention fleece, directly on top of stones. The root barrier is installed underneath the insulation. PMRA stone ballast sandwich: Patented pre-vegetated moss-sedum mat installed on one layer of water retention fleece, sandwiched between two layers of stones. The root barrier is installed underneath the insulation. Conventional: Patented pre-vegetated moss-sedum mat installed on two layers of water retention fleece, drainage/filter layer and root barrier. PMRA stones below: Patented pre-vegetated moss-sedum mat installed on two layers of water retention fleece directly on top of stones. The root barrier is installed underneath the insulation. PMRA stone ballast sandwich: Patented pre-vegetated moss-sedum mat, two layers of water retention fleece, sandwiched between two layers of stones. The root barrier is installed underneath the insulation. 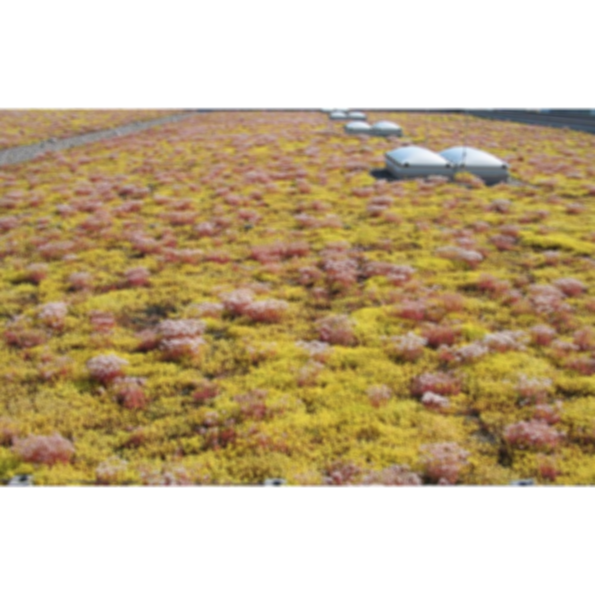 Conventional: Patented pre-vegetated moss-sedum mat installed on a layer of mineral wool above one layer of water retention fleece, drainage/filter layer and root barrier. PMRA stones below Patented pre-vegetated moss-sedum mat installed on mineral wool and one layer of water retention directly on top of stone. The root barrier is installed underneath the insulation. PMRA stone ballast sandwich: Patented pre-vegetated moss-sedum mat installed on mineral wool and one layer of water retention fleece, sandwiched between two layers of stones. The root barrier is installed underneath the insulation. Conventional: Patented pre-vegetated moss-sedum mat installed on a mineral wool slab above one layer of water retention fleece, drainage/filter layer and root barrier. PMRA stones below: Patented pre-vegetated moss-sedum mat installed on a mineral wool slab above one layer of water retention fleece, directly on top of stone. The root barrier is installed underneath the insulation. PMRA stone ballast sandwich: Patented pre-vegetated moss-sedum mat installed on a mineral wool slab above one layer of water retention fleece, sandwiched between two layers of stones. The root barrier is installed underneath the insulation.